Introducing a convenient mod for those who want to create your own clan. This mod will be able you to have excellent team for your clan. Mod “recruiter” will put your message in the chat on the recruitment and conditions of the clan and it will happen automatically. In addition, it is possible to set the time of the message also mod has ability to overload the text without reloading the game (CTRL and ALT) . You task to write text and select this mod. Author fof mod is Dark_Knight_MiX. 1. For correct mod work you need to edit the configuration file by using only Notepad ++. 2. Turn off the chat filter in mod P-mod (if you have it) or mod will not work. Open file WOT \ res_mods \ 0.9.19.1\ ClanMessages.json. Write message in quotation marks in a row “Messages”: “”. 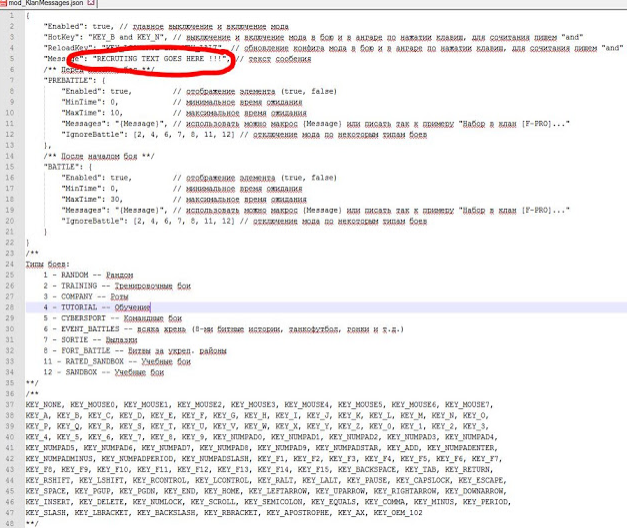 Copy the scripts folder and file in ClanMessages.json WOT \ res_mods \ 0.9.19.1\, confirming the replacement.